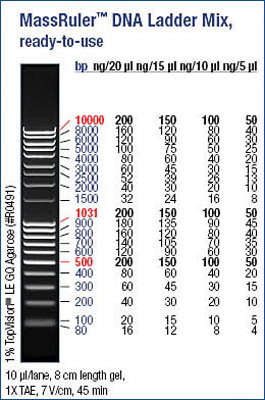 Perform acurate quantification and sizing of DNA fragments by agarose gel electrophoresis with this mixture of individual chromography-purified DNA fragments. This product or its use is covered by at least one claim of U.S. Patent Nos. 5,834,201, 6,680,378, and/or 7,132,520 owned by Invitrogen Corporation. The purchase of this product conveys to the buyer the non-transferable right to use the purchased amount of the product in internal research conducted by the buyer. The buyer cannot use this product or materials made by the employment of this product for Commercial Purposes. Commercial Purposes means any activity for consideration and may include, but is not limited to: (1) use of the product in manufacturing; (2) use of the product to provide a service, information, or data; (3) use of the product for therapeutic, diagnostic or prophylactic purposes; or (4) resale of the product, whether or not the product is resold for use in research. Further information on purchasing licenses under the above patents may be obtained by contacting the Business Development Department, Invitrogen Corporation, 5791 Van Allen Way, Carlsbad, CA 92008.